A Guymon home was completely destroyed by fire at noon on Tuesday. The house fire, located at 1323 N. Quinn, was reported to 911 at 11:57pm Tuesday morning. “As Guymon Firefighters were responding from their Stations they could see smoke coming from this area of town”, said Assistant Fire Chief Grant Wadley. As Firefighters arrived at the scene, they found the house fully involved with fire and smoke, coming out of all windows and door ways of the house. Firefighters battled the fire for over an hour before gaining control of the blaze. The home is owned by Leroy Montano Sr. of Guymon who was also the one that called 911. Mr. Montano stated that he noticed smoke coming from an upstairs window then saw flames shortly thereafter making him call 911 immediately. The home was not being occupied at the time of the fire. Fire Investigators are still investigating the cause of the fire but early indications are of combustible materials too close to a space heaters or a floor heater. “Firefighters remained on the scene till late in the afternoon extinguishing hot areas and continuing the investigation to this fire”, stated Wadley. 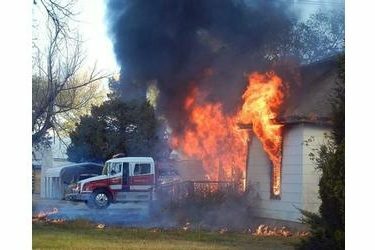 The house was totally destroyed by fire with cost estimates not available at this time. Two Firefighters received minor injuries during the blaze, they were treated and released at the scene by Paramedics. “With much colder weather upon us, it is important to know safety with space heaters”, says Assistant Chief Wadley. Make sure combustible materials such as clothing, furniture, window curtains, etc. are not nearby. A safe area around a space heater is at a minimum 3 feet. Space heaters should not be in the same area or even a room as flammable liquids are stored. When the heater is not in use, it should be turned off and unplugged. Most of all remember that all homes should have working smoke detectors. Guymon Firefighters were assisted at the scene by the Guymon Police Department, Guymon Emergency Management, DA Task Force, Guymon Public Works Department, and Tri-County Electric.